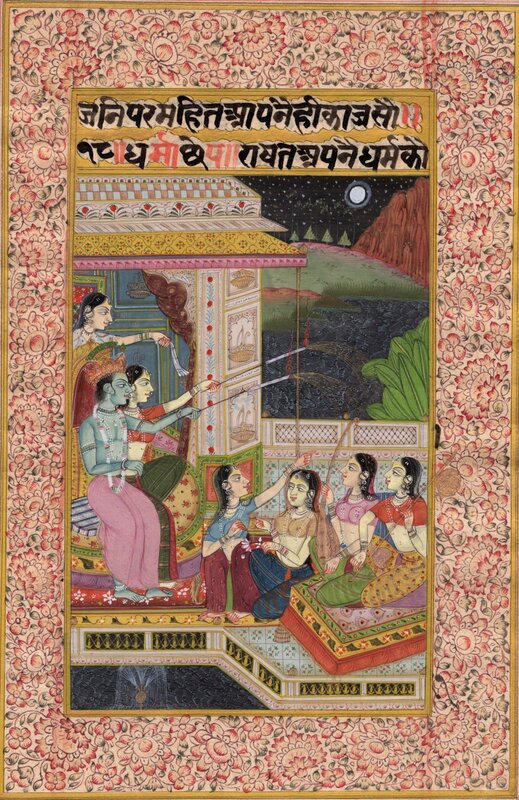 Add a festive touch to your personal art collection with the addition of this Indian artwork featuring Radha and Krishna lighting fireworks while participating in Diwali, also known as the festival of lights. Diwali (or Deepavali, the “festival of lights”) is an ancient Hindu festival celebrated in autumn. It is one of the largest and brightest festivals in Hinduism. The festival spiritually signifies the victory of light over darkness, knowledge over ignorance, good over evil, and hope over despair. Its celebration includes millions of lights shining on housetops and fireworks mark a major way it is celebrated. You’ll love the bird’s eye perspective, enabling you to see everything that’s happening, all the action of Radha Krishna and their friends across the courtyard. You can see the colors, feel the joy of the festival and almost hear the music being played by the seated musicians. The distinctive style of artwork focuses on exceptional detail, bold colors, and definitive lines, blended together seamlessly to create a harmonious composition. It is the most joyful of paintings that you will long to own. A busy painting indeed…..and full of adventure and history that will provide hours of viewing pleasure. Don’t miss out on buying this exclusive and rare Indian art composition featuring Radha Krishna in a Diwali festival setting. Be the first to acquire it.